Ordination Class of 2019: Deacon Paul Wargovich. Published 3/29/2019. Local. BRIGHTON -- Deacon J. Paul Wargovich II grew up in a Catholic family in Plymouth. He and his four sisters were homeschooled, and his family prayed the rosary together and started almost every day with Mass. In a February interview with the Pilot, Deacon Wargovich said he started studying the catechism and taking his faith more seriously as a teenager. "I was raised in it, but I kind of made it my own, especially in my high school years," he said. Two experiences made him think about the possibility of a vocation to the priesthood, both of which involved witnessing the celebration of a sacrament up close. One experience had to do with his grandfather, who was diagnosed with terminal cancer. Deacon Wargovich spent a lot of time with him before he died. "He was a man of great faith. As he was dying, he was consoling us. He was a really great role model. And I was blessed to be with him when he died," Deacon Wargovich said. When his grandfather took a turn for the worse, his family called in a priest who had known them for years. Deacon Wargovich was present when the priest gave his grandfather the anointing of the sick. He contrasted this with attending Mass and sitting in the back of a church while the priest is in the front. "This was a sacrament happening right in front of me, and that was very moving for me," Deacon Wargovich said. He added, "It dawned on me over time -- something I like to say is, the doctor can prolong a life, but ultimately, the priest saves a life. The priest saves the soul." The other experience that made Deacon Wargovich think about the priesthood was becoming an altar server. He was trained to serve in the Latin Mass and sometimes he stood next to the altar with the priest. On one occasion, he was able to look into the paten and chalice and see the consecrated bread and wine while praying the Agnus Dei. At that moment, he was struck by the thought, "This is real." "Over time, more and more, I just found the priesthood on my mind," he said. 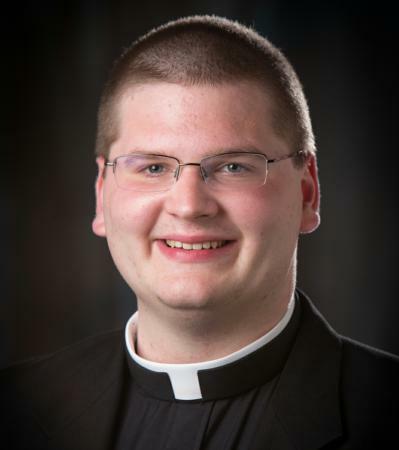 As Deacon Wargovich approached the end of high school, he told his family that he was seriously considering the priesthood. A priest friend put him in touch with a vocation director. Seeing no reason to delay, he decided to enter college seminary after graduating from high school. He attended Our Lady of Providence Seminary in Rhode Island and graduated from Providence College with a B.A. in philosophy. He then went to attend St. John's Seminary for his four years of theology. "Something that gets drilled into you, not just by teaching but by your own experience living every day, is that God is the center and God is in control. One of the psalms says 'put no trust in earthly princes but in God.' And I think, in different ways, every vocation makes you realize that God is in control, God is the center, and that's something that I kept coming back to over the years in seminary," Deacon Wargovich said. He was ordained a transitional deacon in April 2018 and assigned to St. Joseph Parish in Needham. He said serving as a deacon "has been absolutely incredible" and that he looks forward to celebrating the sacraments after his ordination to the priesthood this May. One of his favorite scripture passages is the end of Matthew's gospel, when Jesus instructs the apostles to baptize people in all nations. Deacon Wargovich has baptized 28 people so far. "It's an absolutely amazing, incredible thing," he said.